These sprinklings from the collection highlights a disturbing incidence of cancer among 419ers and their spouses. 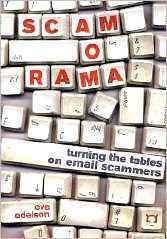 The scammers seem prone to religious conversions, and speak in strikingly similar terms: "I have not particularly lived my life so well, as I never really cared for anyone (not even myself) but my business." So stop and smell the roses. Here are displayed the scammer's "name", the illness prompting re-evaluation of life choices, time remaining for karmic re-balancing, sum available, the purpose to which the scammer hopes you will put the imaginary money, and where it can be found.